I've updated Revolutionary Manny (a.k.a active_manny). The upper part of the Grim Reaper Robe (along with facial expressions) is contained in the new file too. There's a preview render. The newly drawn material is applied on the old model too, so it might look a little better than it actually is. Pockets and leather pouches are 3D too. P.S. : There seems to be another suit (like the one with the rope climbing), it's utilized when he gets on and off of the Bone Wagon. I'll update it as soon as I identify it. It looks good although the top of the belt you can see on the left of the new model could be thinner and the bottom of the trousers should be a bit more rounded. I did some kind of advertisement for this project on the DFA backers forums. Hey Nitrus, great work. A good way to attract possible new team members, (and fans) is to create a Moddb.com page! I believe it could be even shown even on the main page. Hey guys, sorry I've been absent for a while I've been pretty busy lately. Way to go Nitrus, looks like you've been working pretty hard, it all looks great! I'm not much for modelling but I reckon I could have a go at increasing the resolution of some of the textures. Any ideas where I should start? Otherwise I'll just pick one from year 1 (maybe Salvador or Domino) and just have a go. Hello everybody. Diablo fever has passed, but lazyness stayed. Some cool things happened here, since my last visit. I'm especialy exited about the fixed texture mapping on the head-2 model. So, whats the next model to reshape? Rubacava-Manny, i guess? Or Reaper-Manny? I'm looking forward to beat the lazyness and do some modeling this weekend. ps. a few weeks ago, i tried to compile the meche-model from year one, but it was totaly messed up after importing into blender. the same happend with the gatekeeper-model from year four (just two random models for testing). i dont know if this is an issue of the compiler or the blender-importer or what. 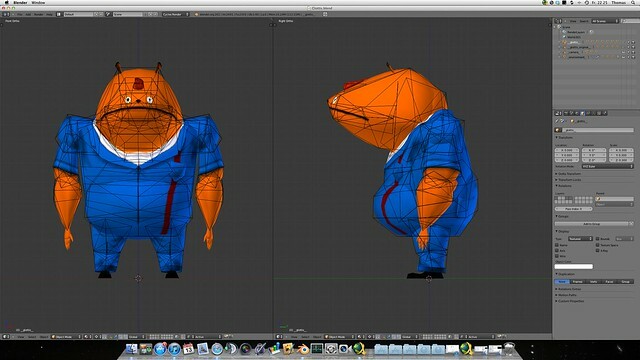 well, its not a problem at the moment, since we didnt had messed up models of manny or glottis so far. Nice! I've been looking for you two! Regular Suit Manny (The one from Blacksad). Revolutionary Manny (This one could do with some work). @cplhenshaw I messed around with your tools a bit, and I made it read all strings to lowercase, but that created problems later on with the updating of the 3DO, which means this isn't a solution, just a temporal fix. I did this because if you look in the files like manny_head2.3do, you'll see that the Material files have been compiled with an uppercase extension, which confuses the read3do function, since all file names in matNames.h are lowercase. As for the textures, I think Rubacava Manny would be next in line, or whatever you feel like doing, although I think Domino would be a great addition, gotta love that villain . I'm not sure about if he appears in a suit in the first year, I can remember him boxing, in the sweaty shirt, but I don't remember if he appeared in a suit. I resized all the textures I've used four times (eg. what was 128 now is 512), because I think this was agreed upon earlier in the posts. (except for the Grim Reaper texture, and some other one-color textures, I didn't see the point in rescaling those, it would only be a waste of space). You should use the tool I've made (The Grim Reaper lolz) to import and export BMP's or TGA's as well as multi texture MAT files. On a side note, I've had some problems with TGA export and then import when using Photoshop. It could either be a Photoshop thing, or the Libraries I'm using. So what I'm doing is use BMP for editing in Photoshop and Importing in the MATS, but TGA's for importing into Blender, since my Blender wouldn't read BMP, dunno why. Just as a refresher, what I do when editing textures is: I get them in Photoshop, convert them to RGB, resize them, edit as I please, and then convert them back to Index using an *.ACT Palette which you can export with the Grim Reaper tool, just don't save one Pallete on top of the other, it appends it instead of replacing it (a bug in my code). Or I think you could just save the pallette from Photoshop, before converting to RGB of course. 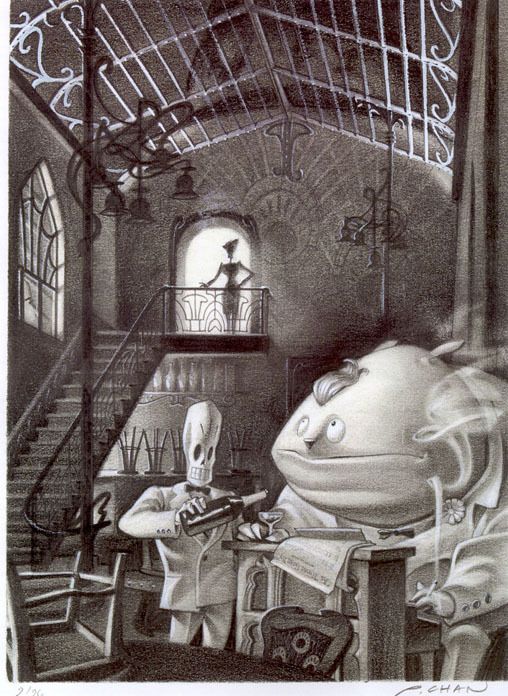 Here is the recent version of Glottis. klick I don't know if i posted it before. The different head models are still in original shape. Before i remodel them, i need some feedback, because i use the "standard"-head as reference for the others. Is the new head ok, or should i change some things? Because of the round shape it looks very different from the original, but its very difficult to get a balance between the cubic original an a nice round "hi"-poly version. Depending on concept-scetches, i prefer a more rounded style. I already looked at it, and I like it. Just smooth out the normals at the sides. Because of the round shape it looks very different from the original, but its very difficult to get a balance between the cubic original an a nice round "hi"-poly version. 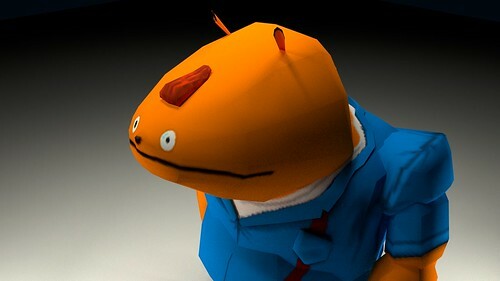 I know, with the original it's as if they took a regular cube, dropped it down a flight of stairs and then they named it Glottis. I like this style better too. I only thought about adding depth to the eyes, to make them 3D, but this will create additional work with the other heads, since he's got a lot of different expressions (One eye opened, the other closed, or that beady look he's got sometimes)... Maybe it's better to leave it as it is. @nitrus. What do you mean by "smoothing out normals"? Smoothing angles between faces? I know what normals are, but how can i smooth them out? Earlier in the tread, somebody mentioned we could make eyes and mouth 3d. It could look nice, but the problem is, that there are fare more different face textures than head models. So we get into a conflict when the texture switches, but the head-model stays the same. It might be nice to make his hair look more like hair so it looks more like a tuft of hair (or pony tail on his forehead) rather than a lump on his head like in the original. You could try giving him slightly sunken eye sockets like in the concept art but keep the actual eye as a texture. Or would that not work. His chin might look better if it is modelled rather than just a texture of shade. So he would have a chin and then a fat neck hanging down. Otherwise it looks good to me. I have no idea how to do it in Blender. The only thing in Blender that I know about it is that you can "Recalculate Normals", which I don't think will work. In Max you can manipulate them at will. But no matter, It might just be an occlusion/shadows thing happening in the render, we'll see how it actually looks in-game. About the eyes, yes I see what you mean. He has 5 heads (I think), and about 13 textures. Which means for example, in one texture he's blinking, in another texture his eyes are wide open, and both of the textures use the same head model. I guess that leaves 3D eyes out of the picture. About the hair, I really don't know how it could get any better than this, except if maybe the back part of it is a bit combed upwards (a few more polys), like in the concept art. It really doesn't bother me like this, but I'll leave that to you. And @Ezekiel000, what an eye for details you have! About the chin Blacksad, I don't know how you're holding up with polys in that area, but maybe a slight row of faces could be pulled a bit downwards, just so it would get that 3D effect (again, like in the concept picture). If you're doing this though, try not to over do it, I think your model looks great as it is. UPDATE: Here's the Meche model taken out of DATA001.LAB. I renamed the "MeArm.mat" to "mearm.mat". As I said, case-sensitivity is important. It looks good to me, she's supposed to be sitting down, that's how they made her, because in Year One, that's all she does. The black area around her collar is supposed to be transparent in game. The only weird things, are the fingers, they are rotated in a weird way. Again, I think that's how they made her, and that's how we must mod her. P.S. : I rotated her this way, normally she looks like she's lying down (like all the other models). In my opinion, your glottis models needs physical modeled eye balls. In the model format as well as the position of each part of the model, there is also some default rotation of each piece. Most of the models in the first half of the game don't have any rotation data, so they come out fine, but as you move through the game they start to use them (and some of them are unrecognisably contorted). My code basically ignores because I thought it would be a pretty hard thing to do. It might be easier to make some python script to do this in Blender, and then undo it when you're ready to export, as presumably there is a simple way to rotate an object using the Blender API.